If set up correctly, you can manipulate how the coyote comes into a stand for better shot opportunity. 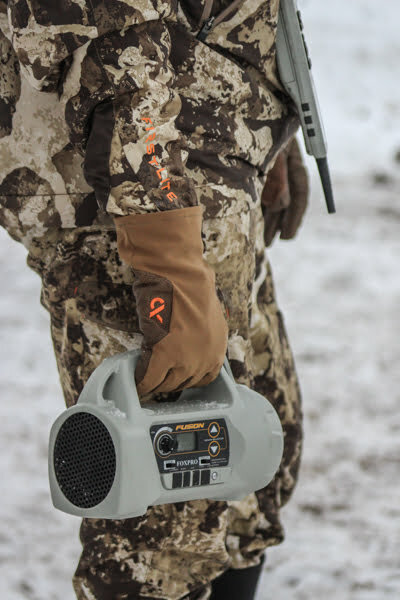 This year we upgraded our older Foxpro Fury caller to the Foxpro Fusion caller. After using the new updates and features Foxpro has implemented, I wanted to write a review. 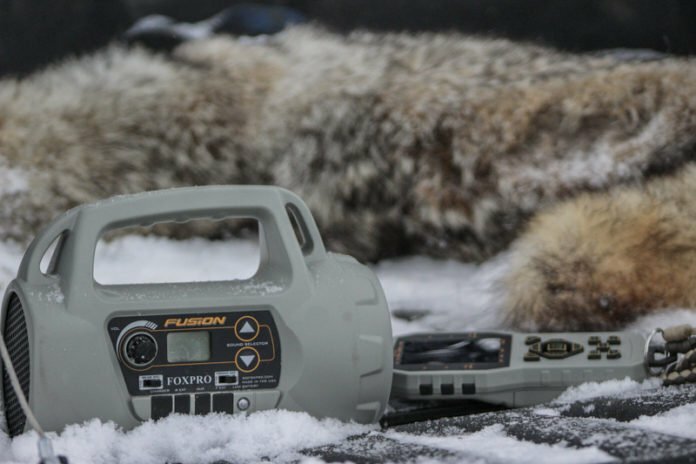 The Foxpro Fusion is a 3.5 lb caller in a small package that is easy to carry. Its 4GB internal memory makes it able to house 1,000 sounds. The website states a runtime of 3-7 hours, uses 8AA batteries to power and has an operating distance of >100 yards from the remote. The housing cases the front horn speaker and the rear cone speaker that can individually be turned off for different scenarios. Additional speakers can be used with the multiple 3.5mm auxiliary jacks on the caller. The caller can be operated without the included remote if desired, but the TX1000 transmitter remote is included. 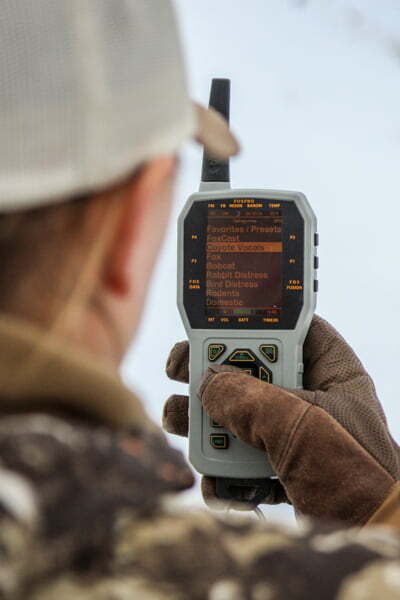 Foxpro also includes its limited 5-year warranty. Additional features include FOXBANG, FOXPITCH, FOXDATA, FOXMOTION, FOXCAST, FOXFUSION and FOXGRIP. I will go through a few of those features in detail below. Something I like about this Foxpro caller is its packability. 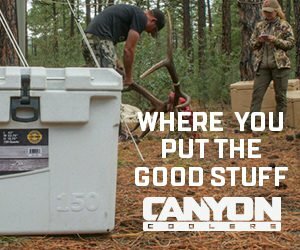 The Fusion fits in a small backpack or can easily be carried in hand to and from the stand. I typically get around five 20-minute stands before having to swap the batteries. One con for me is the inability to see what battery life is left on the caller. There is a green flashing light on the front of the caller that flashes when the battery is low, but nowhere on the remote. In the daylight, it’s tough to see the light flashing and you always have to have it facing towards you. It would be nice to pull the caller out after a few days and be able to see battery life. When turned up to the max volume of 40, the sound remains clean with no cracks. However, that will depend on the quality of sounds you add to a certain extent. The website claims the caller can be used over 100 yards from the remote. The maximum distance I have used on a stand is about 75 yards, which is plenty in my opinion, and the remote always worked great. We did test it at 100 yards once for the review and the remote worked as it should. The TX1000 remote was a giant reason for my upgrade. My previous Foxpro Fury caller was great except for that older TX500 remote. The dial on top was problematic for me, especially when cold and the buttons didn’t have a defined click. The TX1000 is an awesome remote with simple functionality. The large buttons have a defined feel when you click them, great with gloves on. It takes 3AA batteries and I change them around every 15 sets. There is a battery indicator for the remote shown on the screen. There are multiple backlight screen colors to choose from for day hunting, night hunting, and the standard Foxpro backlight color. You can quickly change the screen brightness and the button labels are also backlit. The sounds can be shown organized into folders or in one big list by their sound number. There is a favorites folder that you can add sounds for quick access. The favorites list can be added to from the remote, you don’t need a computer. The remote displays a running time clock from when it is turned on and can be reset anytime. One of the reasons I wanted to upgrade to the Fusion was a few of the new features that can all be controlled from the remote. The FOXBANG feature lets you program a certain sound at any volume to be initiated when an external sound peaks a certain decibel level in the caller, i.e. a gunshot. I have my caller programmed to a pup in distress sound at the max volume. When trying to get a coyote to stop after a shot you don’t have to touch your remote to change sounds, it does it automatically. Another feature I frequently use is FOXFUSION as it lets you play two sounds at once. For example, as I’m playing a rabbit in distress I can also play coyote growls, adding some realism to the set. I have also played around with FOXCAST, which allows you to configure an entire stand sound list to play at the push of a button. For example, I can configure a FOXCAST to play coyote howls, then wait five minutes before playing prey distress, until waiting ten minutes to start howling again. This feature allows you to be completely hands-free of the remote. The FOXMOTION feature will move the sound from one speaker to the other, simulating movement. FOXPITCH lets you manipulate the pitch of any sound in hopes of triggering a response. The FOXDATA feature allows you to track stand data like temperature, barometric pressure, sounds used, time on stand and more. Another cool feature, that is related to gear, is the FOXGRIP. FOXGRIP is an AR-15 grip with a button that acts as a simple remote for the caller, again eliminating movement. The caller is decoy compatible with the Fox Jack 4. Although I have not invested in one yet, the decoy creates some realistic movements in conjunction with the sound playing. The caller comes preloaded with 100 sounds from Foxpro including prey distresses, fox, coyote, mountain lion, raccoon, bobcat and deer sounds. 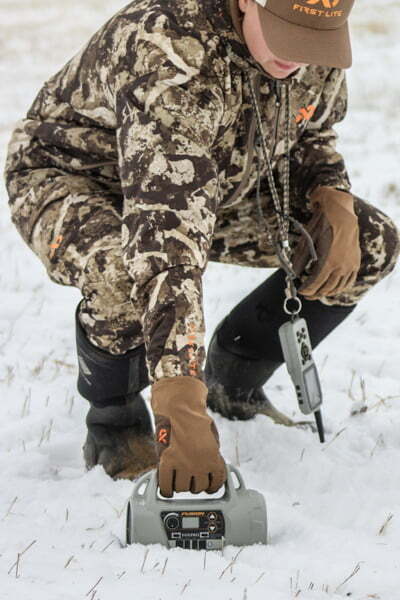 You have a couple of options when purchasing from the Foxpro website. You can purchase with the standard sound list or a custom sound list. Sounds are simple to add with the FOXPRO Programmer application downloaded to your computer. You simply need a USB 2.0 A/B cable to connect the caller to your computer. That cable is commonly used for connecting a printer, so you may already have one as I did. Once in the program, you can add or subtract sounds and also create new, rename and organize folders to your liking. Additional sounds can be found and purchased on Foxpro’s website as well as a number of other websites with a quick Google search. The formats supported for audio sounds are .FXP, 24B, MP3 and WAV files. After new sounds are loaded onto your caller, you can wirelessly sync the remote with the caller and all of your changes will be displayed on your remote screen. Over the last couple of months, I have called around 20 coyotes in with this caller. It is very nice to get the sound away from my location and have so many different sounds to use. I have been able to set the caller in accordance with the wind and have pulled coyotes right into my lap. In combination with the speaker quality, solid remote, great sound features and packability, I will be using this caller for many seasons to come. 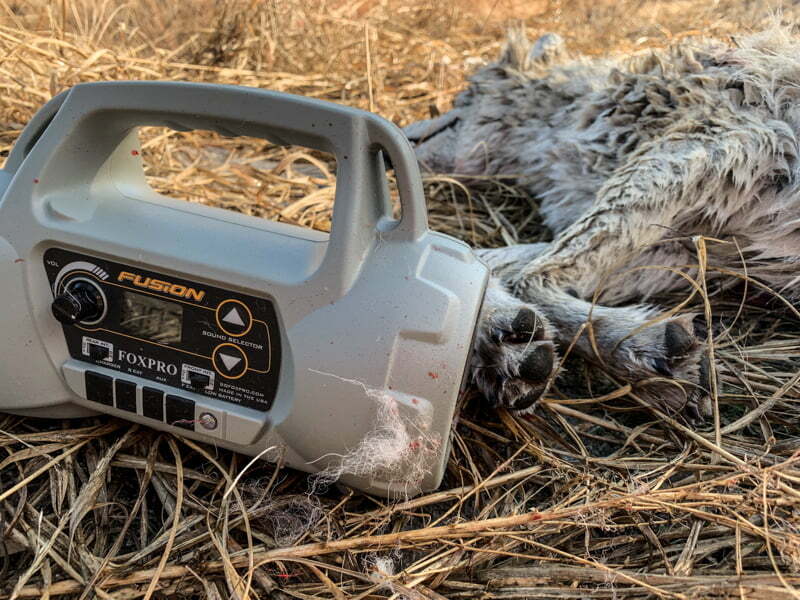 The Foxpro Fusion can be found on at www.gofoxpro.com. The caller begins at $399.95 in the solid sage green color or $449.95 in their camouflage option.